In this study 1,4,7,10-tetraazacyclododecane-1,4,7,10-tetramethylene phosphonic acid (DOTMP) was used as the polyaminophosphonic acid carrier ligand and the therapeutic potential of the bone seeking radiopharmaceutical 47Sc-DOTMP was assessed by measuring its dosage–dependent skeletal uptake and then the absorbed radiation dose of human organs was estimated. Because of limited availability of 47Sc we performed some preliminary studies using 46Sc. 46Sc was produced with a specific activity of 116.58 MBq/mg (3.15 mCi/mg) and radionuclide purity of 98%. 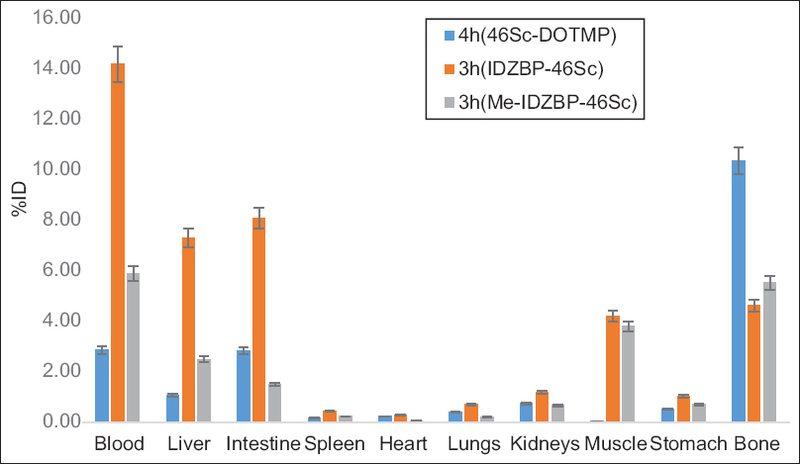 46Sc-DOTMP was prepared and an activity of 1.258 MBq (34 μCi) at a chelant-to-metal ratio of 60:1 was administered to five groups of mice with each group containing 3 mice that were euthanized at 4, 24, 48, 96 and 192 h post administration. The heart, lungs, liver, spleen, kidneys, intestine, skin, muscle, and a femur were excised, weighed, and counted. The data were analyzed to determine skeletal uptake and source organ residence times and cumulated activities for 47Sc-DOTMP. 46Sc-DOTMP complex was prepared in radiochemical purity about 93%. In vitro stability of complex was evaluated at room temperature for 48 h. Biodistribution studies of complex in mice were studied for 7 days. The data were analyzed to estimate skeletal uptake and absorbed radiation dose of human organs using biodistribution data from mice. By considering the results, 47Sc-DOTMP is a possible therapeutic agent for using in palliation of bone pain due to metastatic skeletal lesions from several types of primary cancers in prostate, breast, etc. 47Sc is one of these suitable radioisotopes which has ability to link to bone-seeking ligands with short half-life of 3.47 days and has attracted attention for using in nuclear medicine in recent years.,,,,,, 47Sc is a low β− emitter (Eβ1Max = 0.600 MeV [32%], E β2 Max = 0.439 MeV [68%]) which emits a γ-ray at 0.159 MeV, therefore images could be obtained to assess bone target, document disease status, and predict therapeutic efficacy at the time of administering the therapeutic agent. There are different nuclear reactions such as 47Ti(n, p) 47Sc and 46Ca (n, γ) 47Ca→ 47Sc for production of 47Sc in a reactor. The first reaction requires E n > 1 MeV and an enriched target, but the second reaction uses thermal neutrons. The disadvantage of the latter reaction is the requirement of an enriched target while presently 46Ca is available with only 30% enrichment and at a very high price. ,,Due to limited access to 47Sc, in this study and preliminary experiments, 46Sc radionuclide, which has similar chemical properties, was used. ,,,,, 46Sc with a long half-life (83.8 days) and one medium energy β− and two γ-rays (EβMax = 0.3 MeV, Eγ = 1.12 MeV (100%), Eγ = 0.88)MeV (100%) can be produced simply by direct thermal neutron irradiation of natural 45 Sc and it is an ideal radionuclide for assessing the chemistry, stability, and biodistribution of scandium-labeled compounds. However, its long half-life and emission characteristics are unsuitable for clinical studies., Similar chemical properties have also resulted in similar activity bio-distribution and hence for dose calculations replacing the nuclear physical characteristics of 47Sc with those of 46Sc can be considered equivalent to 47Sc dosimetry. In the present paper, preparation of 46 Sc-DOTMP complex and its preliminary biological studies in animal models were studied. Then we evaluated the potential of 47 Sc-DOTMP to deliver 47 Sc to the skeletal surfaces of human by using MIRD formalism and considering to 46 Sc-DOTMP biodistribution data from mice. In nuclear medicine, MIRD formalism is the most commonly used method for the calculation and estimation of internal dose. 46Sc was produced with a specific activity of approximately 116.58 MBq/mg (3.15 mCi/mg) and radionuclide purity of >98% by irradiation of natural Sc2O3 target (0.73 mg) at a thermal neutron flux of approximately for 3 days at Tehran Research Reactor (TRR). DOTMP was purchased from Fluka Co. (Switzerland). Whatman No.1 paper was obtained from Whatman (Maidstone, UK) for instant thin layer chromatography (ITLC). All other chemical reagents were purchased from Merck (Darmstadt, Germany). Animal studies were performed in accordance with the United Kingdom Biological Council's Guidelines on the Use of Living Animals in Scientific Investigations, 2nd ed. This study was performed using five groups of healthy male mice, each group containing 3 mice, with nominal weight of between 25 and 35 g which were purchased from Pasteur Institute, Tehran, Iran. The radiopharmaceutical was injected into the tail vein of the mice. Following administration and at certain times, animals were sacrificed. The heart, lungs, liver, spleen, kidneys, intestine, urinary bladder, femur and the muscles surrounding the femur were dissected, weighed, and counted. A high purity germanium (HPGe) detector coupled with a Canberra™ (model GC1020-7500 SL) multichannel analyzer and a dose calibrator ISOMED 1010 (Dresden, Germany) were used for counting distributed activity in mice organs. 46 Sc was produced by irradiation of natural Sc2O3 target at a thermal neutron flux of for a period of 48 h at the TRR. Following irradiation, the target was cooled for 8 days and subsequently dissolved in 3M HCl by gentle warming to prepare 46 ScCl3. The resultant solution was diluted to the appropriate volume with ultra-pure water, to produce a stock solution of final volume of 10 ml. The radionuclide purity of the solution and assay of the total activity produced was carried out by using HPGe spectroscopy. The total activity was obtained ~85.1 MBq (~2.3 mCi). The radiochemical purity of 46ScCl3 was evaluated by employing ITLC using (a) %10 ammonium acetate:methanol (1:1) mixture and (b) 10 mM/l diethylenetriaminepenta-acetic acid (DTPA). 2.2 ml of 46ScCl3 solution (18.5 MBq of 46Sc activity) was evaporated to near-dryness by slight warming 2 times. The 46Sc-DOTMP complex was prepared by adding 2.2 ml of 46ScCl3 solution to 80 mg of DOTMP and then dissolved in 1 ml of 0.5M NaOH buffer (metal to ligand ratio of 1:60). The pH of solution was adjusted to ~8 by adding another 2.2 ml of 0.5 M NaOH buffer. The mixture was gently heated for 10 min and then stirred in water bath with a temperature of 90° for 1 h. The radiochemical purity of 46Sc-DOTMP complex formed was determined by employing TLC using %10 ammonium acetate:methanol (1:1) mixture as the eluting solvents to discriminate free scandium from radiolabeled compound. For optimization of the labeling yield, experiments were carried out to determine the complexation yields of 46Sc-DOTMP at different ligand to metal ratios ranging between 20:1 and 60:1 by varying the ligand amount, while keeping the amount of 46Sc fixed at 0.35 mg. The in vitro stability of the 46Sc-DOTMP was studied by incubating the complex (prepared using 80 mg of DOTMP and 0.35 mg of 46 Sc) in pH ~8 at room temperature for a period of 48 h after preparation. The radiochemical purity of the complex was determined at regular time intervals by employing paper chromatography using %10 ammonium acetate:methanol (1:1) mixture and 10 mM/L DTPA as the eluting solvents and using standard quality control techniques. Since the chemical behavior of an element is dictated by its atomic number and all isotopes of the same element have identical behavior, biological systems fail to recognize the difference between atomic weights and treat all isotopes in the same fashion. Therefore, in calculating the cumulated activities for 47 Sc the biodistribution data of 46 Sc were used while considering the physical half-time of 47 Sc. Before calculating the cumulated activity in source organs, a mass correction method (kg/g method) was used to extrapolate biokinetic data from the animal model to human. In this method, the %ID/g in a certain human organ is equal to the %ID/g in the same mouse organ multiplied by the ratio of the body mass of human and mouse as equation (3). The required mass data for the standard adult male of 73 kg were taken from ICRP89. 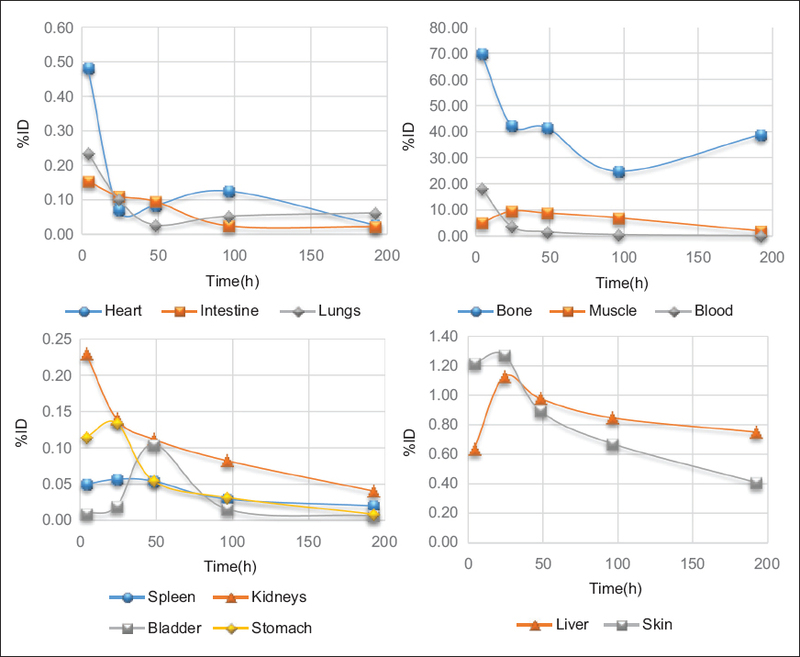 Then the activity versus time curves for the source organs including: lung, stomach, intestine, liver, spleen, kidney, bone, muscle, skin, and remainder of the body in human were plotted. The residence times in the source organs are calculated by fitting a multi-component exponential function to these activity-time curves using Matlab software (The Mathworks Inc. R2013.) The program returned the values of fi and λi for the equation (4). Where fi is the amount of activity associated with the component i of source region, and λi is the biologic elimination constants for the component iλi=0.693/Ti(hr−1), where Ti is the biological half-time for component i(hr) and λp represents the physical decay constant for the radionuclide of interest., The residence times τ in the source organs were obtained by integration of respective fit functions, from t = 0 to t = infinity, after accounting for the physical decay of the 47 Sc. These values were calculated using the same method as described in the MIRDOSE3 code. Then the cumulated activities in the source organs for a 3.7 MBq (100 μCi) injected activity, in MBq-s, were calculated as equation (2). In equation (5), D is a measure of the total energy associated with the particular radiation type and is a physical entity known from the radioisotope's decay scheme, f (t, s) is the absorbed fraction for the particular radiation emitted in the source organ, s, and absorbed by the target organ, t, and m is the mass of the target organ. So as the S-factor is relevant to the particle energy that is emitted by radionuclide and the particle energies of 46 Sc is different from 47 Sc, for dose calculation the S-factor of 47 Sc is used. Tables of S for many target and source organs and for many radioisotopes were published in MIRD pamphlet No. 11. In this study, the S-factors for 47 Sc were used from this pamphlet. The S-factor for the remainder of the body, RB, were calculated by equation (8) according to MIRDOSE III computer software recommendation.,, In equation (5), S(rk ⟵ RB) is the S-factor for remainder of body irradiating target region rk, S(rk ⟵ TB) is the S-factor for total body irradiating target region rk, S(rk ⟵ rh) is the S-factor for source region rh irradiating target region rk, mTB is the mass of the total body, mRB is the mass of the remainder of the body, and mh is the mass of source region rh . The radiation absorbed dose to red marrow was also estimated according to MIRD recommendation , and calculated by equation (9). The dynamic bladder model and the gastrointestinal tract model were not used. Irradiation of natural Sc2O3 target at a thermal neutron flux of for a period of 48h and 8 days after the end of bombardment yielded 46 Sc with a specific activity of ~116.58 MBq/mg (~3.15 mCi/mg). Scandium is mono-isotopic with the atomic mass of 45 and usually, besides 46 Sc, formation of any other scandium radionuclide such as 47 Sc is not expected. However,45 Ca may be formed via the (n, p) reaction.45 Ca is a pure beta emitter and thus difficult to detect. On the other hand considering the cross-sections of (n, γ) and (n, p) reactions on 45 Sc as well as the half-lives of 46 Sc and 45 Ca, it is estimated that the 45 Ca impurity, if at all, was <0.1%. Therefore the radionuclide purity of 46 Sc produced was >98%. The radiochemical purity of 46 Sc was evaluated employing ITLC using two solvent system: (a) In %10 ammonium acetate:methanol (1:1), free Sc 3+ cation was remained at the point of spotting, (b) in 10 mM/L DTPA, free Sc 3+ cation was complexed into more Sc-DTPA form and moved from solvent front while almost no radioactive fraction was remained at the point of spotting. In both chromatographic systems no other radiochemical species was detected [[Figure 2] and [Figure 3]]. 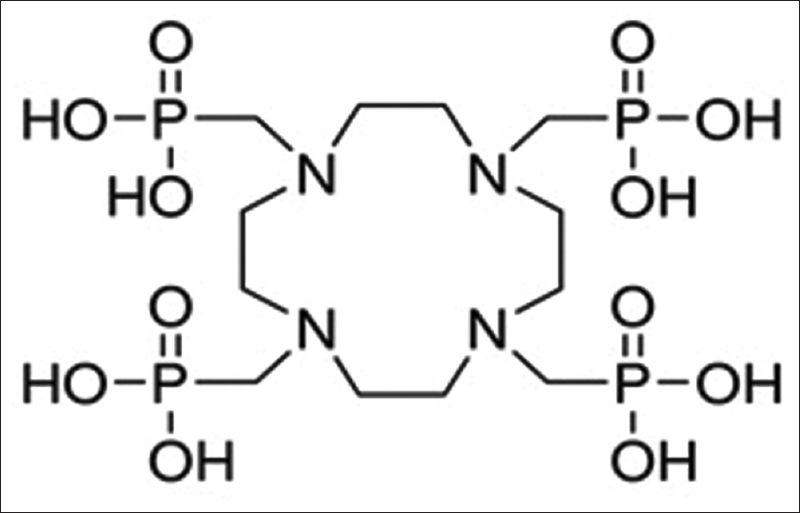 Radiochemical purity of 46 Sc-DOTMP complex was ascertained by using ITLC. For ITLC %10 ammonium acetate:methanol (1:1) used as the eluting solvent, and it was observed that 46 Sc-DOTMP moved toward the solvent front while 46 ScCl3 under identical conditions remained at the point of spotting.46 Sc-DOTMP complex was obtained with a radiochemical purity of ~93% using 80 mg of DOTMP and 0.35 mg of 46 Sc in 3 ml reaction volume (corresponding to a ligand-to-metal ratio of 60:1) within a pH range of 7–8 at room temperature. Experiments carried out by keeping the amount of 46 Sc fixed at 0.35 mg and gradually increasing the amount of DOTMP. The excellent complexation yields (~93%) were achieved at ligand to metal ratio of 60:1. [Table 1] shows the complexation yields of 46 Sc-DOTMP obtained at various ligands to metal ratios. 46 Sc-DOTMP complex exhibited excellent in vitro stability at pH ~8 when stored at room temperature. The radiochemical purity of above-mentioned conditions was found to be retained to extend of ~93% after 48 h postpreparation [[Figure 4] and [Figure 5]]. 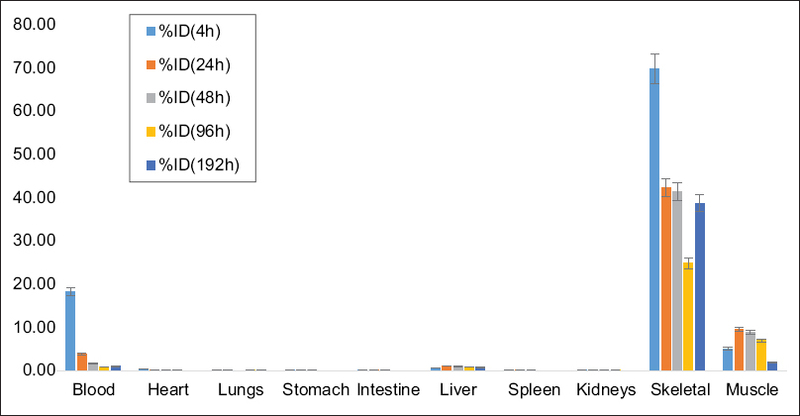 The uptake of 46 Sc-DOTMP complex in the different organs/tissue of mice expressed as percentage of injected activities (%ID) per organ/tissue at different postinjection times is shown in [Table 2] and [Figure 6]. The results of the biodistribution studies revealed significant bone uptake within 4 h postinjection. 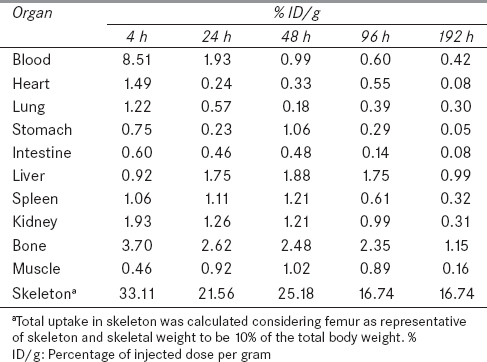 The observed uptake in femur at this time point was 3.7 %ID/g corresponding to a skeletal uptake of 33.11 %ID/g for 46 Sc-DOTMP that is similar to the 3.94 %ID/g and 3.72 %ID/g measured by Banerjee et al. for 153 Sm-DOTMP and 153 Sm-EDTMP respectively and reasonably close to the 4.37 %ID/g by Banerjee et al. for 175 Yb-EDTMP. The measured uptake for bone in this study is also close to the 4.23 %ID/g measured by Das et al. for 177 Lu-DOTMP. A comparison between biodistribution results (%ID) in this study for 46/47 Sc-DOTMP, 4 h postinjection and in Neves et al. for 46/47 Sc-IDZBP and 46/47 Sc-Me-IDZBP, 3 h postinjection showed that the former provided significantly better biodistribution profile in animal model because of higher uptake in bone and lower uptake in other major organs [Figure 7]. 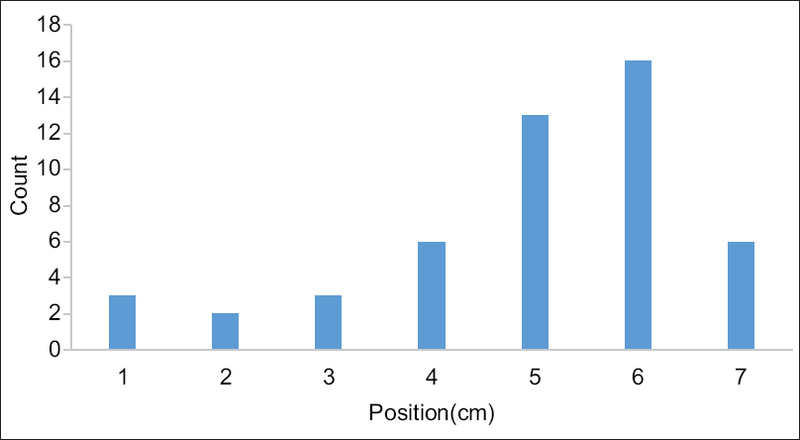 The estimated %ID for human using a mass correction method are shown in [Figure 8]. The results showed the most of activity was accumulated in the bone, blood and muscle. The activity versus time curves for the source organs were plotted [Figure 9]. The residence times in the source organs are calculated by nonlinear regression analysis that was performed by the activity-time curves [Table 3]. Then cumulated activities in the source organs for a 3.7 MBq injected dose, in MBq-s, were calculated. [Table 4] gives the human target organ doses that are estimated by applying MIRD scheme. The human dose estimates indicate that the bone would receive a radiation absorbed dose from 47 Sc-DOTMP is more than 2 times that any other target organ. This estimate was 3.27 mSv/MBq that is >0.920 mSv/MBq measured by Breitz et al. for 166 Ho-DOTMP in patients with multiple myeloma and is almost close to the 3.93 mSv/MBq measured by Simón et al. for 153 Sm-DOTMP. Because of similar nuclear physical characteristic between 153 Sm and 47 Sc, it was assumed that the absorbed dose should have been more closer than these values, but the difference between 153 Sm and 47 Sc could be the result of following factors: 1:different S-values, 2:different formalism for calculating the red marrow accumulated activity that Stabin and et al. indicated  and, 3:different experimental conditions. The dose to the red marrow estimated here, 0.836 mSv/MBq, is almost close to the 0.517 mSv/MBq measured by Breitz et al. and near to the 0.755 mSv/MBq measured by Simón et al. The results that obtained in this study are compared with the Breitz et al. 's and Simón et al. 's results in [Figure 10]. 46 Sc-DOTMP complex was prepared in high yield and excellent radiochemical purity (~93%) using 46 Sc produced by thermal neutron irradiation of natural Sc2O3 target and DOTMP. The complex exhibited excellent in vitro stability (~90% radiochemical purity) at room temperature up to 48 h postpreparation. Radiochemical studies showed that the complex could be prepared in high yield at a ligand-to-metal ratio of 60:1. 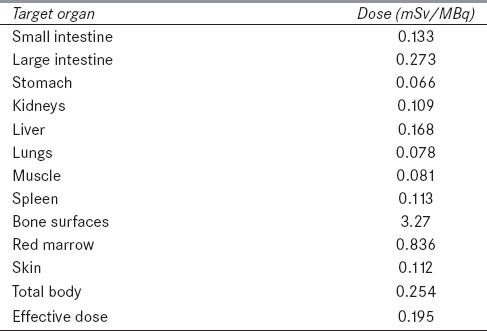 Biodistribution studies in mice showed rapid selective skeletal uptake of injected activity (3.7 %ID/g in femur at 4 h postinjection) with fast clearance from blood and small uptake in any of the major organs/tissue [Table 2]. 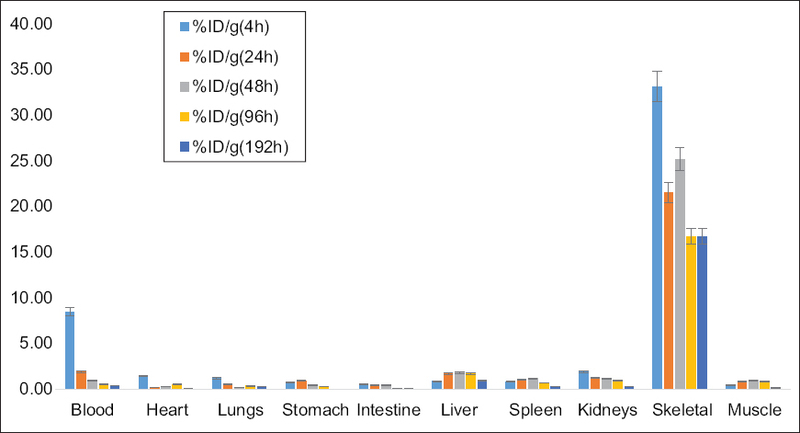 Although the principles of inter-species dose extrapolation are poorly understood and applied  earlier studies have shown the usefulness of using animal biodistribution as a model for absorbed dose estimations in humans., Therefore, the amount of radiation absorbed doses to human were estimated using MIRD scheme by multiplying the cumulated activities in the source organs that were calculated by estimating %ID for human (using a mass correction method from mice biodistribution data) and using Matlab software, to S-values of 47 Sc from MIRD pamphlet No. 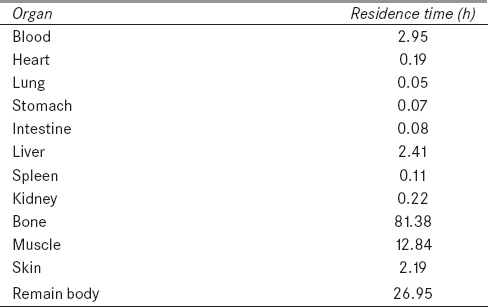 11 and are shown in [Table 4]. The highest absorbed doses were estimated for the bone (3.27 mSv/MBq), red marrow (0.836 mSv/MBq) and large intestine (0.273 mSv/MBq). The absorbed dose for the bone that was estimated in this study is similar to the Simón et al. 's result for 153 Sm-DOTMP  [Figure 10]. This result was expected due to almost identical range of beta rays in bone (0.32 mm for 153 Sm and 0.20 mm for 47 Sc ). The preclinical results reported here indicated that 47 Sc-DOTMP showed promising features in animal models that warrant further investigation in higher animals to become useful in treating patients with skeletal metastasis. Banerjee S, Chakraborty S, Das T, Kothari K, Samuel G, Venkatesh M, et al. 177Lu-DOTMP, 153Sm-DOTMP, 175Yb-EDTMP and 186/188Re-CTMP: Novel agents for bone pain palliation and their comparison with 153Sm-EDTMP. BARC Newsl 2005;261:22. Majkowska-Pilip A, Bilewicz A. Macrocyclic complexes of scandium radionuclides as precursors for diagnostic and therapeutic radiopharmaceuticals. J Inorg Biochem 2011;105:313-20. Chakraborty S, Das T, Unni PR, Sarma HD, Samuel G, Banerjee S, et al. 177Lu labelled polyaminophosphonates as potential agents for bone pain palliation. Nucl Med Commun 2002;23:67-74. Paes FM, Serafini AN. Systemic metabolic radiopharmaceutical therapy in the treatment of metastatic bone pain. Semin Nucl Med 2010;40:89-104. Das T, Chakraborty S, Sarma HD, Banerjee S. 177Lu-DOTMP: A viable agent for palliative radiotherapy of painful bone metastasis. Radiochim Acta 2008;96:55. Hassfjell S, Ingebrigtsen K, Bruland ØS. Synthesis, purification and biodistribution of (205)Bi-DOTMP, visualizing bone deposition patterns with autoradiography. Nucl Med Biol 2001;28:425-33. Majkowska A, Neves M, Antunes I, Bilewicz A. Complexes of low energy beta emitters 47Sc and 177Lu with zoledronic acid for bone pain therapy. Appl Radiat Isot 2009;67:11-3. Moghaddam-Banaem L, Jalilian A, Pourjavid M, Radfar E, Bahrami-Samani A, Yavari K, et al. Development of a radioscandium immunoconjugate for radioimmunotherapy. Radiochim Acta Int J Chem Aspects Nucl Sci Technol 2012;100:215. Moghaddam-Banaem L, Jalilian AR, Pourjavid M, Bahrami-Samani A, Mazidi M, Ghannadi-Maragheh M. Preparation and quality control of scandium-46 bleomycin as a possible therapeutic agent. Iran J Nucl Med 2012;20:19. Müller C, Bunka M, Haller S, Köster U, Groehn V, Bernhardt P, et al. Promising prospects for 44Sc-/47Sc-based theragnostics: Application of 47Sc for radionuclide tumor therapy in mice. J Nucl Med 2014;55:1658-64. Neves M, Teixeira FC, Antunes I, Majkowska A, Gano L, Santos AC. Chemical and biological evaluation of 153 Sm and 46/47 Sc complexes of indazolebisphosphonates for targeted radiotherapy. Appl Radiat Isot 2011;69:80-4. Połosak M, Piotrowska A, Krajewski S, Bilewicz A. Stability of 47Sc-complexes with acyclic polyamino-polycarboxylate ligands. J Radioanalytical Nucl Chem 2013;295:1867. Anderson WT, Strand M. Stability, targeting, and biodistribution of scandium-46- and gallium-67-labeled monoclonal antibody in erythroleukemic mice. Cancer Res 1985;45:2154-8. Kolsky KL, Joshi V, Mausner LF, Srivastava SC. Radiochemical purification of no-carrier-added scandium-47 for radioimmunotherapy. Appl Radiat Isot 1998;49:1541-9. Srivastava SC. A Bridge not too Far: Personalized medicine with the use of theragnostic radiopharmaceuticals. J Postgrad Med Educ Res 2013;47:31. Stabin MG. MIRDOSE: Personal computer software for internal dose assessment in nuclear medicine. J Nucl Med 1996;37:538-46. Berry RJ, Haybittle JL. Guidelines on the use of living animals in scientific investigations – A publication of the Biological Council. Br J Radiol 1985;58:1-2. Máthé D, Balogh L, Polyák A, Király R, Márián T, Pawlak D, et al. Multispecies animal investigation on biodistribution, pharmacokinetics and toxicity of 177Lu-EDTMP, a potential bone pain palliation agent. Nucl Med Biol 2010;37:215-26. Loevinger R, Budinger T, Watson E. MIRD Primer for Absorbed Dose Calculations. New York: Society of Nuclear Medicine; 1988. Stabin MG. Fundamentals of Nuclear Medicine Dosimetry. New York, NY, USA: Springer Science & Business Media; 2008. Cember H. Introduction to Health Physics. Pergamon Press Ltd, Headington Hill Hall, Oxfordrence; 1969. Stabin MG. Uncertainties in internal dose calculations for radiopharmaceuticals. J Nucl Med 2008;49:853-60. Talwar G, Srivastava L. Textbook of Biochemistry and Human Biology. New York, USA: PHI Learning Pvt. Ltd.; 2002. Valentin J. Basic anatomical and physiological data for use in radiological protection: Reference values: ICRP Publication 89. Ann ICRP 2002;32:1. Valentin J. The 2007 recommendations of the international commission on radiological protection: Oxford: Elsevier; 2007. Snyder W, Ford M, Warner G, Watson S. MIRD pamphlet no. 11. New York: The Society of Nuclear Medicine; 1975. p. 92. Erwin WD, Groch MW, Macey DJ, DeNardo GL, DeNardo SJ, Shen S. A radioimmunoimaging and MIRD dosimetry treatment planning program for radioimmunotherapy. Nucl Med Biol 1996;23:525-32. Stabin MG, Siegel JA, Sparks RB, Eckerman KF, Breitz HB. Contribution to red marrow absorbed dose from total body activity: A correction to the MIRD method. J Nucl Med 2001;42:492-8. Breitz HB, Wendt RE 3rd, Stabin MS, Shen S, Erwin WD, Rajendran JG, et al. 166Ho-DOTMP radiation-absorbed dose estimation for skeletal targeted radiotherapy. J Nucl Med 2006;47:534-42. Simón J, Frank RK, Crump DK, Erwin WD, Ueno NT, Wendt RE 3rd. A preclinical investigation of the saturation and dosimetry of 153Sm-DOTMP as a bone-seeking radiopharmaceutical. Nucl Med Biol 2012;39:770-6. Sharma V, McNeill JH. To scale or not to scale: The principles of dose extrapolation. Br J Pharmacol 2009;157:907-21. Bélanger MJ, Krause SM, Ryan C, Sanabria-Bohorquez S, Li W, Hamill TG, et al. Biodistribution and radiation dosimetry of [18F]F-PEB in nonhuman primates. Nucl Med Commun 2008;29:915-9. Narra RK, Feld T, Nunn AD. Absorbed radiation dose to humans from technetium-99m-teboroxime. J Nucl Med 1992;33:88-93.